Checkered Chef Baking Sheet & Rack Set Aluminum Cookie Sheet/Half Sheet is currently selling at $22.95, which is its normal price. It has a lowest price of $22.95 and is selling within its usual range. Price volatility is 0.15% (meaning it does not change often), so you might have to wait a while for the price to drop. Until then this is a recommended 'ok deal'. The current deal is also the best price on this item over the last month. 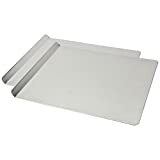 Compare the current price, savings (in dollars & percent) and Buy Ratings for the top Baking Sheets that are closely related to Checkered Chef Baking Sheet & Rack Set Aluminum Cookie Sheet/Half Sheet. Here is how Checkered Chef Baking Sheet & Rack Set Aluminum Cookie Sheet/Half Sheet compares with other leading Baking Sheets. You've asked and now we've delivered! Finally, a set that includes our uniquely designed cooling rack, complete with strengthening crossbar, and a strong, sturdy aluminum baking tray. Now there's no need to worry if your cooling rack will fit your pan - they were designed to work together! If you're looking for a way to cook bacon in the oven or nice crispy chicken wings, this rack and oven pan are the perfect combination. FeaturesYou asked, we've delivered! Our most popular, best-selling cooling rack now comes in a set with a half sheet pan to make this baking sheet set. Team them together for oven baked bacon and crispy chicken wings, or use separately to bake and cool cookies and cakes.The Baking Rack: 100% stainless steel with no artificial coatings or treatments, perfect for oven use. Our unique strengthening crossbar prevents twisting and warping and quickly made the Checkered Chef Cooling Rack one of the best selling racks on Amazon. 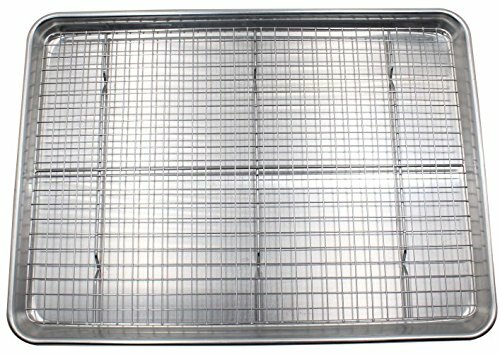 Achieving perfect scores for both "Cleanup" and "Strength and Stability" in recent professional product testing, the Checkered Chef Cooling Rack is proud to be "Highly Recommended" by Cook's Country (America's Test Kitchen).The Pan: Sick of burnt bottoms on your baked goods? The sturdy, aluminum construction of the Checkered Chef Half Sheet Pan gives it superior heat conductivity resulting in even baking with no burnt bottoms. No sharp edges on this bakers sheet pan! 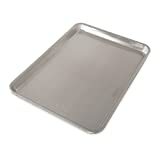 The reinforced, rolled edge is smooth and safe and provides extra strength to help prevent this heavy duty baking sheet from warping.Designed to work perfectly together but also superbly apart, the rimmed tray/cookie sheet measures 18 x13 inches with a depth of 1 inch while the wire baking rack sits neatly inside measuring 17x12 inches. 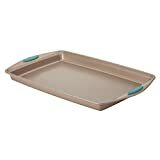 Clean up is easy - handwashing is recommended for the aluminum tray, while the rack is dishwasher safe.